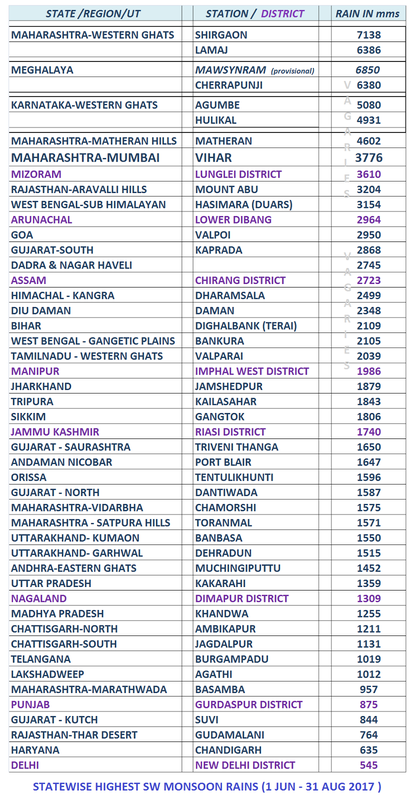 As the southwest monsoon 2017 reaches it's last leg , the latest and updated statewise toppers are as below in Table 1 .. search for your state/region/union territory toppers.. 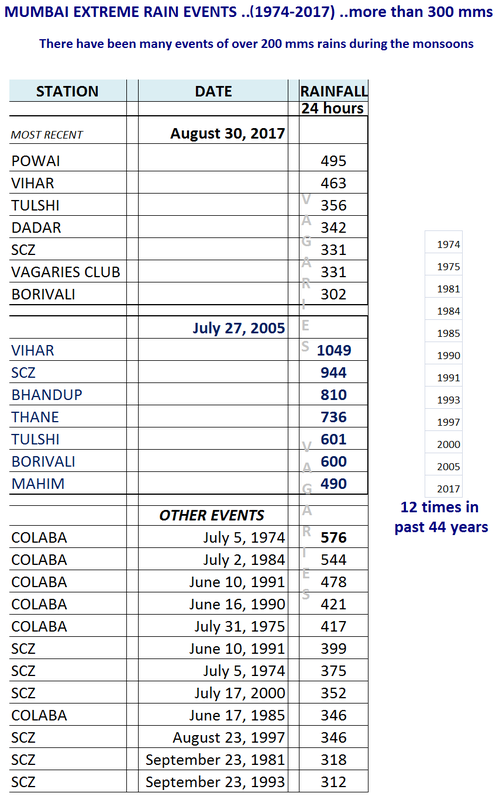 The monsoon city's (Mumbai) latest and updated extreme rainfall events over the past 4 decades are given below in Table 2..
Rajesh Sir - Will we get any more heavy rains in Mumbai and surrounding areas as monsoon enters its final areas. Waiting for thunderstorm in Nagothane...but till now no clouds of thunder ...its pretty humid . Yeah, no wonder its freakin' humid. The Monsoon just doesn't seem to withdraw even from W. Rajasthan. Only goodness knows when North India's gonna get its first taste of that typical Autumn weather: cool and crisp mornings, lots of dew on the grass and trees, warm days, eventually followed by pleasantly cool nights. What's more, Dussehra's round the corner and there's no sign of Autumn, except that the Sun's been setting a bit early. What d'you think @Rajesh Sir? Light Rain and severe lightning in Nagothane...but no heavy or moderate rain. Earlier blog Rajesh Sir mentioned about 200 mb atmospheric pressure for monsoon withdrawal. Most important are 500mb, 200mb. The average pressure at the surface is 1013 millibars. There is no "top" of the atmosphere by strict definition. The atmosphere merges into outer space. There are 5 slices of the troposphere that meteorologists monitor most frequently. They are the surface, 850 mb, 700 mb, 500 mb, and 300 mb (or 200 mb). Why are these slices monitored and not others more frequently? Why not have a 600 mb and a 400 mb chart? Each of the primary 5 levels have a reason they are studied over other slices of the troposphere (sort of). The surface is obviously important because it gives information on the weather that we are feeling and experiencing right where we live. The 850 mb level represents the top of the planetary boundary layer (for low elevation regions). This is near the boundary between where the troposphere is ageostrophic due to friction and the free atmosphere (where friction is small). For low elevation regions the 850 mb level is the best level to assess pure thermal advection. The 500 mb level is important because it is very near the level of non-divergence. This allows for an efficient analysis of vorticity. Actually the level of non-divergence averages closer to the 550 mb level, but 500 mb is a more "round" number as compared to 550 mb so it was used. The 500 millibar level also represents the level where about one half of the atmosphere's mass is below it and half is above it. A level is needed to depict the jet stream. The polar jet stream has a vertical thickness of at least 200 millibars with the core of the jet averaging at about 250 millibars. Either the 200 or 300 mb chart can be used to assess the jet stream / jet streaks. In winter, the 300 mb chart works best and in the summer the 200 mb chart works best for analyzing the core of the jet. The jet stream is at a higher pressure level (closer to the surface) in the winter because colder air is more dense and hugs closer to the earth's surface." Ishan Vajpeyi: An interaction with the WD trough has delayed the withdrawal and brought some rains in extreme North Pakistan and adjoining Jammu. The WD trough will dip a bit south into Central Pakistan and parts of Extreme West Rajasthan on 11th till 14th. Then withdrawal and rapid change should start. Like Vagaries mentioned, the day temperature has risen in Delhi, with S'jing showing 37c on Sunday. Expected to rise another couple of degrees. And now to the regions we love discussing about. So the deviation in rainfall for Konkan and Goa is 0. We cannot look at some exceptional rainfall figures from some specific stations and extrapolate it to the entire area. Its very hot and Humid today in mumbai. May be the Hottest Day for this monsoon season. Thanks, Saurabh. You're correct - Overall, NorthWest India and Central India have had a much worse monsoon than South India. Moreover, Southern parts will get more rains over the next 3 months as part of NE monsoon. Whereas the show is almost over for Western, Central and Northern regions. Yes Avtansh, I agree with you. I wanted to make that point as well in my comment but then the numbers tell the story so well, i thought i will just stick to them. We will revisit the final numbers at the end of the season. What are your thoughts for the remaining days of monsoon. Do we see any significant rain for MP and Vidharbha, Like a low pressure in Bay of Bengal which can remove all the Deficiency. Vinod Desai: Next few days will bring increased rainfall to West M.P. and adjoining North Mah.A trough will remain active , no immediate Low pressure. Scruz was 35.5c on Monday. Thanks for sharing nice information about mumbai. search jobs near by you in mumbai.